For awhile now there have been a number of signs to suggest that Amazon is planning on phasing out the Kindle Voyage soon. 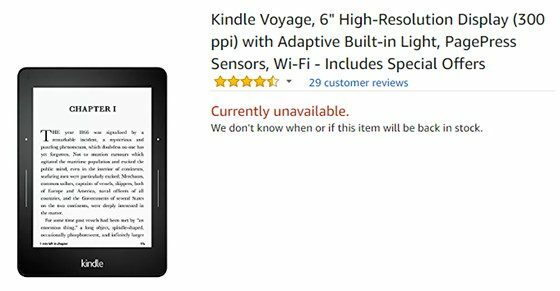 Further evidence on the matter is the fact that the Kindle Voyage is now unavailable on several of Amazon’s international websites. All the European Amazon websites show the Kindle Voyage as currently unavailable, and they no longer advertise it on other Kindle pages, so it appears to be gone for good. This includes the Amazon websites in the UK, Germany, Italy, France, and Spain. Even on the main Amazon.com website the international version of the Kindle Voyage is listed as unavailable, even though they’re still selling it in the US. The Voyage is still for sale on a few of Amazon’s websites, including Amazon Canada and Amazon India, but it seems like they’re slowing starting to phase it out, at least in some countries. The Kindle Voyage was released in 2014 so it’s not surprising to see it go after four years, but it is somewhat surprising that they never released a second gen model. Maybe they will. Or maybe they’ll just call the new model something else. Hopefully they’ll sort of blend the Voyage and Paperwhite into a new model. I think you may be right about a possible blend of the Paperwhite and Voyage. It may come down to what price points they may want to hit…My hope is they make room for a jumbo Kindle…8 to 10″. I agree with a blend between the paperwhite and the voyage and price it at $149. Amazon is the only dominant player in the US so even at that price people will still buy since there’s no competition. If people want a cheaper Kindle they can get a secondhand voyage oasis or paperwhite. Those older kindles are good enough for most and will still be supported with software updates for years to come. At this point there’s no need for more than 2 Kindles, a 6” and a 7”. Even the Basic Kindle is unnecessary at this point considering you can get a second hand Paperwhite for cheaper than a basic kindle. Except the Paperwhite does not support Bluetooth and the ability to listen to audible on the device as does the basic Kindle. If you’re not willing or able to purchase the Oasis, the basic is your only other option to use audible with your device. I’m hoping they add that feature in a new version. On it will definitely be in the new version. I understand but why listen to audible on an e-Reader when you can listen to it on your smart phone with more advanced features? And I understand some people may say due to battery life or what not but then again we’re talking a very few select people. You see that rating? The Voyage is the best 6″ ereader ever made period. Discontinuing it is a mistake. Keep in mind that Kindle’s competitors are doing everything they can to ensure that Kindle is a monopoly in (most) all markets AND, with a monopoly, the monopolist doesn’t care about consumers. At all. That’s why the Voyage and the PaperWhite haven’t been refreshed in years (and years). When a company has a monopoly, what the consumer wants does not matter. Large e-readers? Color temperature controls? New tech? Better firmware? Don’t count on any of it. Amazon will probably release a new model at some point but no one should believe that it will be what they want or need. In a monopoly, the consumer gets what the monopolist tells them they want. None of this, of course, is Amazon’s fault; they’re just doing what economics 101 tells them that they can. The ACTUAL villain, here, is the incompetent Kobo marketing department and Barnes & Noble’s *complete* incompetence. Its not that Amazon has failed us, its more like a combination of the incompetence of Kobo and B&N. The Voyage has been unavailable on amazon.com for a couple of days now. I noticed that too, and they removed it from all the comparison tables. Hopefully they’ll release a new model soon. It’s getting ridiculous with the same Kindle Paperwhite design for the past six years, the same Kindle Voyage for 4 years, and the entry-level Kindle still using an old low resolution Pearl screen that everyone else phased out years ago.